BOSTON, Massachusetts, USA — Friday, May 6th, 2011 — The Free Software Foundation (FSF) has just released in tandem the second edition of its president and founder Richard Stallman's selected essays, Free Software, Free Society, and his semi-autobiography, Free as in Freedom: Richard Stallman and the Free Software Revolution. The books can be ordered at http://shop.fsf.org. As part of the launch, the FSF is also offering copies of each book signed by the author at http://shop.fsf.org/category/signed/. 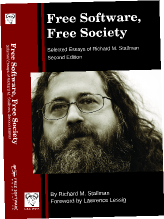 The new edition of Free Software, Free Society features a number of improvements: it has both new essays and updated versions of classic pieces on the GNU Project and free software. Part of the book is devoted to the issue of language framing and its significance in the survival of free software; another discusses the traps that erode computer-user freedoms, and a third urges software users to choose civic values and community over convenience. This edition also adds an index, and a new introduction by FSF licensing compliance engineer Brett Smith. 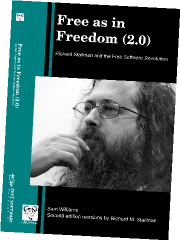 Also now in print is GNU Press's second edition of Free as in Freedom, Sam Williams's biography of Richard Stallman, revised and annotated by Stallman. Williams released the first edition of the book under the GNU Free Documentation License, thus encouraging others to modify and improve upon the work. While the second edition is actually a new joint work, it follows in this original spirit. "I have aimed," writes Stallman, "to make this edition combine the advantages of my knowledge and Williams's interviews and outside viewpoint." Stallman preserves all of Williams's relevant quotes and most of his personal impressions, and contrasts them with his own. These books will be available electronically as PDFs but will notably not be distributed in the Amazon Kindle format or for any other proprietary ebook reading platform, because of the Digital Restrictions Management (DRM) those systems impose on users. "This malicious device," says Stallman, "is designed to attack the traditional freedoms of readers: There's the freedom to acquire a book anonymously, paying cash — impossible with the Kindle for all well-known recent books. There's the freedom to give, lend, or sell a book to anyone you wish — blocked by DRM and unjust licenses. Then there's the freedom to keep a book — denied by a back door for remote deletion of books." Proceeds from the sale of these books will help fund the FSF's campaigns to defend and promote computer users' rights — including its work against DRM via the DefectiveByDesign.org campaign. Ordering: the books can be ordered online at http://shop.fsf.org, where signed copies are also available. Wholesalers: contact sales@fsf.org for pricing. Review copies: if you are a reviewer or a teacher interested in using the books in a class, please contact sales@fsf.org about obtaining review copies. Media contact: for book signings, public appearances, interviews, and speaking engagements, please contact rms-assist@gnu.org. The Free Software Foundation, founded in 1985, is dedicated to promoting computer users' right to use, study, copy, modify, and redistribute computer programs. The FSF promotes the development and use of free (as in freedom) software — particularly the GNU operating system and its GNU/Linux variants — and free documentation for free software. The FSF also helps to spread awareness of the ethical and political issues of freedom in the use of software, and its Web sites, located at fsf.org and gnu.org, are an important source of information about GNU/Linux. Donations to support the FSF's work can be made at http://donate.fsf.org. Its headquarters are in Boston, MA, USA.